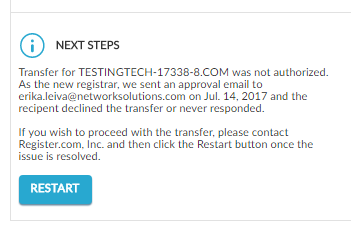 Network Solutions—Can I Restart a Failed Domain Transfer? For domain transfers into Network Solutions, the Current Status column on the Transfer In page alerts you of any errors. Once you have corrected the issue, then you can click the Restart Transfer button to restart the domain transfer. Transfers can be restarted until they expire, 90 days from the purchase date. 1. Click here to log in to your Network Solutions Account Manager. 2. Under the My Domain Names icon, click the Transfer Status link. 3. On the status page, click the + sign next to the domain that you want to restart. 4. Click the Restart button. 4. To authorize the transfer, click here for details. If the transfer is not listed or if the Restart Transfer button does not appear, then please contact customer service for assistance at 1-866-908-3442. How Do I Authorize a Domain Transfer? My Domain Transfer Failed Due to an Invalid Authorization Code—What Can I Do?